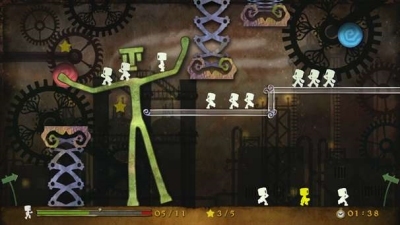 Leedmees Kinect uses your body to guide its hapless tiny travellers home. While this full-body iteration of Lemmings meets Twister is perfectly pitched and well executed, the real excitement is the theatre it creates in your living room. It makes perfect use of your body to control the game. The reason this works so well is that it makes perfect use of your body to control the game. You soon become acutely aware of the implications of an ill advised motion, and start to take great care. 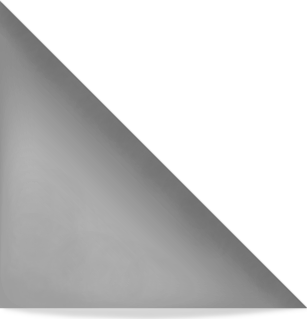 It also applies the physics of your movement to the objects in the game. This means as well as lifting and carrying the little chaps you can also juggle with them from one arm to another - here it reminded me of pinball bumper switching. As things get more tricky there are platforms you need to punch out the way, as well as switches to trigger or swipe and other dastardly obstacles that spell inevitable doom for the innocent little Mees - unless you can intervene. 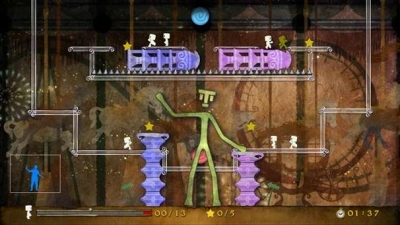 The first co-op level for instance attaches the spawn points to one of the player's limbs. 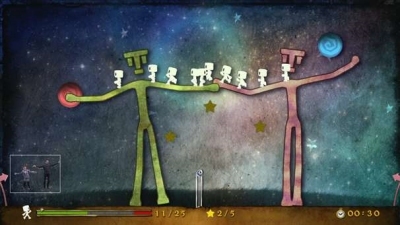 This means that both players have to hold an awkward pose to ensure the minions can safely escape (ed: sounds like twister to me). It sounds simple, but soon descends into hilarious chaos, and of course if you laugh to hard your on screen character does likewise - as I found out to disastrous effect. 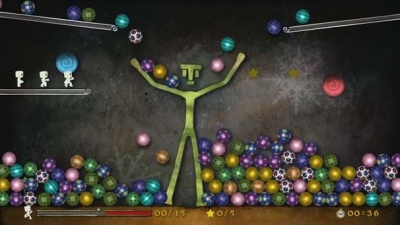 A Kinect game all ages will be able to enjoy. 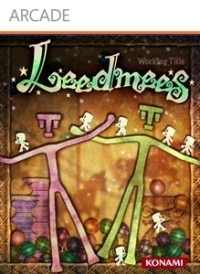 Leedmees offer over 50 single-player and 12 co-op levels and will be available via XBLA later in the summer. If there is any justice in gaming land, or the world in general, this will be one of the run away hits of the year.